I can see how The Ocean at the End of the Lane would be a thing of magic to many readers. It's certainly well written and imaginative. And I didn't feel as though it was incomplete despite the short length. 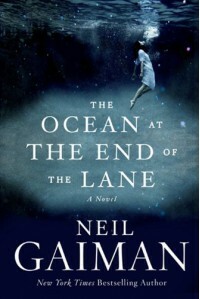 This was my first book by Gaiman, so I wasn't sure what to expect. While I did enjoy the story, I couldn't really connect with it and I'm not sure why. I think there are layers upon layers here that I just wasn't able to uncover. I listened to it on audiobook and I'm wondering if that was part of the issue. Gaiman does a fabulous job of the narration, but I don't always fully engage in audiobooks so I might have missed a few of the hidden gems as a result. I think I may try to read this one again (and read next time rather than listen) at a later date to see if I come away with a different perception.